The Beannick Concert Series producer Terry Miller summed it up when he announced the program for the season – “We’re punching way out of our weight class here”. The line-up for the three concert season included artists that do not normally perform in venues as small as the Studio/Stage Door. 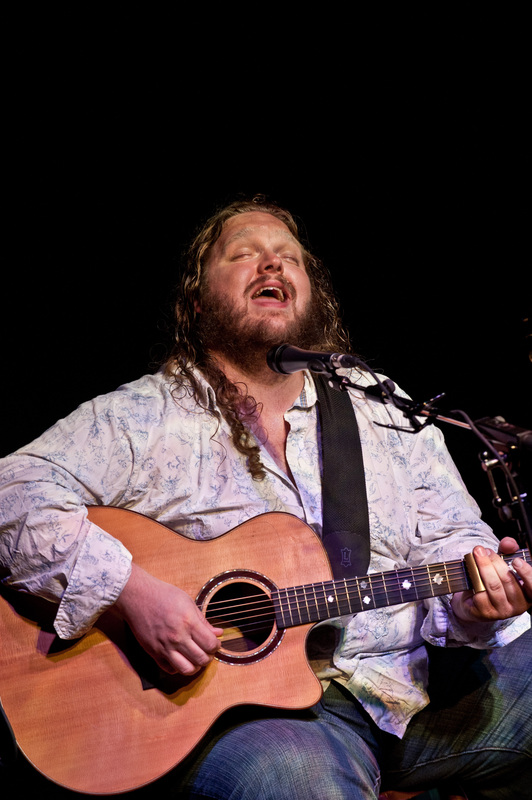 This was very much in evidence when Matt Andersen came on stage and launched into a blistering, but nuanced, evening of spectacular blues vocals and guitar playing. Here was a performer who, with ease, could fill the largest of concert venues. He is not from the delta; he’s not from Chicago; he’s from the small town of Perth-Andover (population 2,500) in New Brunswick. It is hard to believe he was born in rural Canada and far and away from the normal blues stereo types of black, poor, suppressed and depressed. He is a big white boy with all the power and punch of the classic blues belters. Throughout the evening he worked his way through a host of original songs and classic blues that celebrated some of the usual and not so usual blues themes. There were travelling songs; songs about good relationships (“saying the right thing at the right time is always worth a song”) and bad relationships (“The Devils Bride”); a reworking of James Taylor’s “Steamroller” (“I’m a steamroller baby and I wanna roll right over you”). James Taylor never sounded as black as Matt did on Tuesday night. There were lots of classic lines and imagery in songs like “Working Man Blues” and the self parody “One Size Never Fits” (I’m six foot two / four hundred pounds / of a man that’s full of love / I might look like the guy on the ten most wanted / you know I’m nothin’ to be scared of). He had a great feeling for the use of dynamics and pacing. Regardless of blues belting or soft soulful lyrics his spectacular guitar playing was a perfect complement to the essence and mood of the song. There were lots of blazing leads, slide and bass runs with little nuanced riffs that created very original performances. All the songs were stitched together with a relaxed impromptu stage patter that featured lots of give and take with audience. It was an impressive improvisational tour de force that had the audience in the palm of his hand. They responded with a standing ovation that was far more heartfelt than usual for Cranbrook audiences For the encore he orchestrated the enthusiastic audience participation in “People Get Ready”. Gordon Johnston, the concert series musical director, has the uncanny talent for finding the unusual, the almost unknown and the truly gifted performers for the concert series. It appears he is still on a roll with Tuesday evening’s performance of Matt Andersen at the Studio / Stage Door.